Bihar is a Northeastern India State. Bihar Has Been Around for 3,000 Years! India's state of Bihar is located in the country's northeastern region. It is one of the world's longest inhabited locations geographic locations. Ancient India culture emerged. It's located between West Bengal to the east and Uttar Pradesh to the west. Nepal is located north of the state, and Jharkhand is directly to its south. It's India's twelfth largest state by area, with 38,202 square miles, and it's the third most populated, with almost 102,000,000 people counted in the 2011 census. Most of the people that live in this state live in villages; some live in more urban areas. A large portion of Bihar is a flat plain, which is divided horizontally by the Ganges River that runs west to east. The official languages spoken are Hindi and Urdu, but several other dialects are present too. In Ancient India, this was a powerful state with influence over Indian education and culture. India's first great empire, the Maurya Empire, actually originated here. 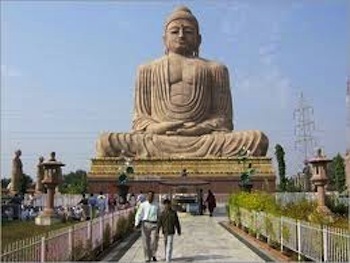 Another huge claim to fame of this state is that the India religion of Buddhism originated here. Although Buddhism is not as widely followed in India as it once was, it is a very popular religion in other parts of Asia. Basically, it was born here and its popularity died down, but it became hugely popular in other areas of the world. Bihar is currently trying to improve its economy and the quality of living for its people because many of its inhabitants live in poverty. The state needs to put a plan in place soon to help residents because the population here grows between twenty to twenty-five percent every decade. Most jobs in the state are service oriented. In fact, roughly 55% of employed persons work in the service field. There's a small industrial sector here that accounts for about 9% of the state's job force. Agriculture is the state's other major employment sector, making up about 35% of jobs. Up until 2006, Bihar suffered one of the lowest GDP growth rates in all of India, but has since grown between 11% and 18% each year. In short, its economy is growing steadily in comparison that of the larger India economy. Art is an important attribute to the culture here, as it is in all parts of India. Madhubani painting is a popular style of painting here. It originated at the time of the Ramayana, when a king known as Janak commissioned artists to paint events surrounding his daughter Sita's marriage to Lord Ram. The painting style was traditionally done on the walls of village mud-huts, but people now paint on cloth, paper and canvas instead. Madhubani painting usually depicts nature and Hindu religious motifs. When you visit, you will want to see the remains of the ancient city of Vaishal, one of the areas where civilization began. The ancient Mahabodhi Temple is known as a birthplace for Buddhism and is considered very sacred. The state contains the popular tourism attraction of the Mahatma Gandhi Setu, which is the second longest river bridge in the world! In fact, these sites amongst historic forts and several additional sacred temples bring in more than six-million tourist annually! If you are thinking of traveling to India, this state is destination you will not want to pass up. Leave Bihar to discover more India States. Discover what it's like n India today! Visit our homepage to explore India!